Brutal.io is an online game from the creator of Wings.io. Control your car and throw your flail against other players! 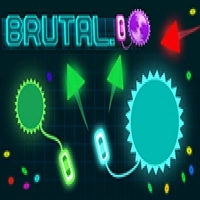 Grab energy from various sources to grow your flail, become number #1 and dominate the arena in this abstract world where you can even be swallowed by a black hole. Game directions: Easy to play, hard to master. Click to release your flail and click again to get it back. Green sentinels will steal energy from you if you get too distracted. Brutal.io gameplay relies on pure 2D physics and after some time playing, you will feel in control of your car and your flail. You will start developing your own smart strategies to catch your enemies, whether its by crushing them against a wall, waiting for them at the entrance of the central room or by surprising them in the middle between your car and your flail. Join this clever 2D physics game and play in real-time, with millions around the world.